I don’t know about you, but I cannot stand cold calling. I don’t like it when people cold call me, and I don’t like to cold call people. I would much rather that someone who is interested in our services call me! How does that happen? Nowadays, you have to rank well in the search engines: Google, Yahoo, Bing (but mostly Google), meaning if someone types in “lawn care McKinney” and you’re on the first page, typically you’re going to get a phone call. 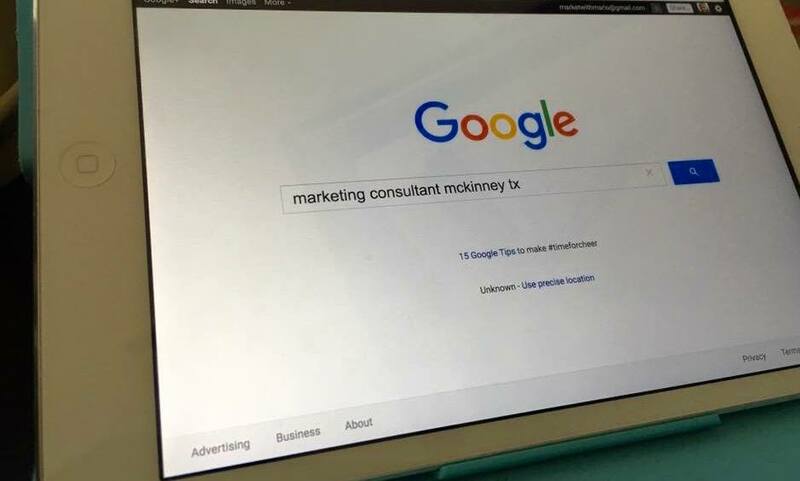 And here at Market With Mario we do eat our own cooking, so to speak, so when you Google “marketing consultant McKinney TX” you will get us on the top of the first page! So we are receiving inbound phone calls, and inbound leads and emails. We have people that are searching for and looking for our services, as opposed to me calling up every business owner in McKinney and going, “Can we please help you with marketing?” It reverses the dynamic, and makes it less of a sale and more of a consultation, which is a much better position to be in. Make sure that Google can actually crawl and read your website. You and I look at a website and we see words and pictures and things like that. Google crawls it from behind, and if it cannot read it, or if you have a bunch of errors in the code of your page, it’s not going to rank it. So that’s one thing we do for all of our clients is to make sure that Google can actually crawl the page. Make sure your website is mobile friendly. If you’re having to pinch your phone screen all the time to see your website better, it’s not mobile friendly. Also, if you put your website into Google as a Google search, it will tell you if your website is mobile friendly. Three, make sure that your website loads quickly. We live in a microwave culture where we want everything right now! If your website takes more than 3-5 seconds to load, not only is no one going to wait that long, but that is also a ranking factor in the search engines! So make sure that your website loads quickly, even change hosting if that’s what you need to do. These are things we can help you with. When you’re writing content on your website, write it to the end user or the reader, and don’t write it to please an algorithm. The algorithms change so much that if you have everything geared to a certain algorithm and it changes, your website is going to fall off the face of the earth. But more importantly, Google wants us to write content that is helpful and useful for the reader. If you’re writing what’s called “keyword stuffing,” where you’re just putting in your keywords every other word, Google knows that you’re trying to trick the system and they’re not going to reward you for it. So just write good content, helpful content, and Google will start to index that. And that leads me to number five, which is to update the content frequently! What we’re doing for all of our clients is weekly blogging, and that gives Google something new to find every week. Google calls the page, finds something new, and re-indexes the page. Google loves it when you’re consistently updating your page! I’m not just throwing out a bunch of things that may or may not work, here. We are ranking in the search engines for things like “online marketing McKinney TX,” “marketing consultant McKinney Tx” etc. so we know these things work! And It’s a lot less stressful to have people calling you as opposed to you trying to cold call them. I’m all about inbound marketing, as opposed to outbound marketing!